Self-identity, what culture or ethnicity do you identify with? Your current culture? Your immigrant ancestor’s culture? Perhaps you identify with a culture buried deep in your DNA. See this article as a great primer on the differences between - Ethnicity, Nationality, Race, Heritage, and Culture. Culturally, my wife is an American. I could even say that she is a New Englander. She grew up in an Armenian family, but she doesn’t know the language. What she does identify with is the food and family. Her immigrant grandfather, Reuben, was born in Turkey. Turkish was his nationality, but culturally he associated deeply with the Armenian heritage that was strong in Adana. Nations redraw their lines, form and dissolve over the course of decades. If you had lived in central Europe over the past few hundred years, one day you might be French and the next day German, only to be French again in a week. How long does it take us to lose our ethnicity? If I took my family to Armenia and we stayed there for three or four generations, would they think of themselves as Armenian American Armenians. I doubt it. Each generation would absorb the culture around them to a greater degree. Given enough time, some descendants might think that it was just family mythology that they ever lived in the US. We’ve always been here. We are all immigrants or descendants of immigrants. That goes for the entire planet. If I look at another side of my wife’s family, they’ve been in America for over 350 years. Their immigrant ancestor, Edward Clark, was ethnically English. In turn, Edward’s immigrant ancestor was Norman and the immigrant ancestor before that was Danish. I can keep going back, Iberia, Asia and Africa. Which culture should they identify with? Nationality is fleeting and uncertain. Ethnicity is in your genes, embrace all the cultures of your ancestors. About 50,000 years ago, there were no humans in Armenia, or for that matter, Asia Minor. Over the intervening years, folks trickled in from every direction. 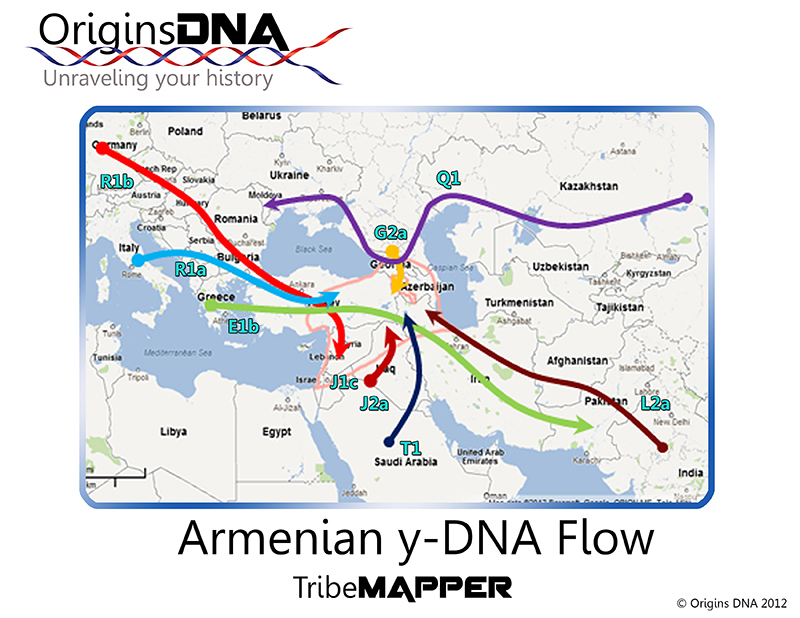 Let’s look at the current distribution of Armenian y-DNA. This is a snapshot of modern Armenia. 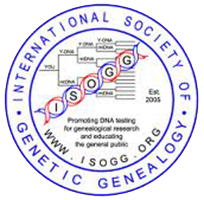 Without analyzing individual haplotypes from this dataset, it is difficult to determine which group arrived first. More than likely each group had multiple waves of immigration across history. I’ve created the map below for you to get a feel for the origin and flow of the major haplogroups. It’s not unusual for groups J1c, J2a and G2a to have high percentages. Those groups also have their origins in that region. The large portion of R1b can be attributed to the crusaders passing through for hundreds of years. Many of the taverns in this region have signs that say, ‘Alexander the Great slept here’. His empire would have contributed the E1b DNA as they conquered eastward and the Dravidian DNA flowed back toward Greece with the spoils. The Roman and Byzantine influence brought the Balkan DNA. The Huns also stopped by on their way to conquer Eastern Europe. My wife can count Armenian as part of her heritage, with roots on the Mediterranean coast of Turkey. Someday I will find her living Armenian cousins in order to get DNA tests. Those results will allow me to identify her deeper ancestral ethnicity. On another line, she is descended from four generations of Sea Captains from Maine with Scottish origins. Should my wife self-identify with all the cultures of her ancestors? Probably not. Should she learn about and understand all those cultures? Definitely. We can pick and choose the best parts of our ancestral heritage and create our own unique ethnic identity. She has a love for the ocean that didn’t come from any early family experience. It’s in her DNA. - "Dravidian DNA", ever heard of the Aryan invasion? It was the other way around. I don't know how you got access to so much false information. Armenians are native to the Armenian Highlands, and new DNA tests reveal that the absolute majority of Armenians don't have their DNA from invaders. That map you've made is simply false. This post is simply false. Where is your evidence to back it up? I'm not saying everything this guy said is right but Armenians do have invaders blood. They are a very isolated gene pool but there is evidence of mixing with "invaders". As an observer with an interest in Armenia, I was sorry to see your post worded the way it was. Unfortunately it amounts to an emotional rant and sadly few of us doing research get influenced by such outbursts. You might win more people to your POV had you been moe thoughtful in outlining your disagreements and provided even some supporting evidence to explain your POV. Metaphorically punching the parent poster in the face is not any way to debate these points. 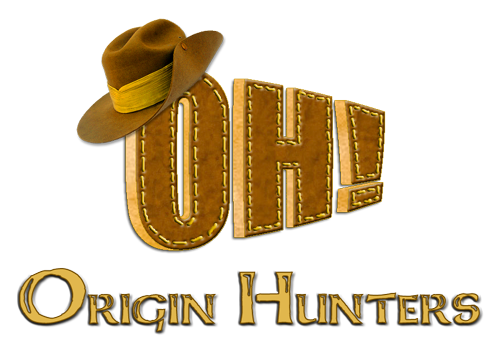 For my part, I believe based on the R1b DNA analysis and associated sub-clades, that the Origin Hunter is providing the better evidence for Crusader influence in Armenia's DNA profile. Is it proven beyond doubt ? - maybe not but the opposite argument is even less provable. lol haha Wars are short lived. Armenia is on the silk road for thousands of years and if any mixing it was from intermingling with others on silk road not with soldiers. Furthermore, these are people with strong backbone and were always successful everywhere they went. They will certainly not write an article like this and claim that their own wife is just a mixture of invaders and she walks around confused about how to identify herself nor they will marry anyone with such worldview or qualities. This must be devastating for your family as well and confusing for your kids too to think of their mother like that. 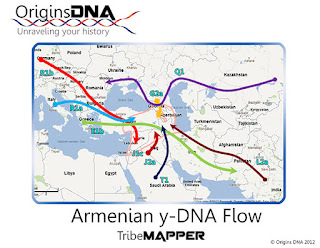 How about, Armenian gene pool is rich located in the cradle of civilization and it was spread all over from the starting point of civilization not the other way around. Its called timeline. I don't know how you look like but your delivery, the subjectivity and twisting things backwards instead of forward you really confuse yourself man.